Living Room Furniture offers the most essential purpose of the industry--lounge. Lounge in comfort and style with our vast selection of stationary furniture. Our styles come from a multitude of brands; and can be customized in terms of size, materials, and upholstery to create the perfect addition for any room in your home. Living Room Furniture also happens to be our largest category – for good reason! The 730+-piece group has the potential for over 7 trillion (yep!) customization combinations. We aren’t kidding around when we say, “we have what you want.” We even have what you may not know you want – you have to see this selection. 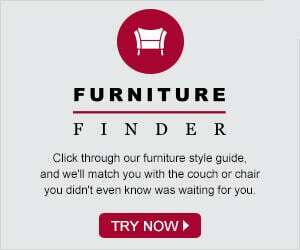 The category itself holds true to the contents of a living room: Chairs, sofas, cocktail ottomans, loveseats, studio sofas, ottomans, chaise sectionals, true sectionals and rugs. Our living room category includes furniture from over 10 individual brands, with 450+ pieces that can be fully customized or filtered using our 21 style tags. Plus, of the whole group, over 1500 are now on sale! Don’t be shy, take a look – we guarantee there’s something here for you. And don’t forget to check out the design center to see your ideas come to life!